After many deliveries in the range, the American yard Hatteras has decided to update its successful 80' motor yacht series. The first model was presented during the Fort Lauderdale Boat Show. Keeping the main lines of her exterior design, the Hatteras 80 was upgraded with an impressive list of small details changed or improved. From the outside, one immediately notices the new portholes, larger and for all guest cabins now. Slightly longer, the 24.33m Hatteras 80 has an optional extended bathing platform, becoming a berth for the tender. It can be hydraulically lowered for launch. The sundeck layout has been entirely revisited, with a new large dining area facing a large bar for four people. The aft area, free of a tender now, becomes a perfect area for chaises longues. And a longer and larger hardtop was designed with the possibility to partially open it. To finish, the foredeck was also upgraded with a new lounge area, and surrounded by a restyled companionway. But the main modifications are inside. The interior design was entirely changed and the layout was astutely reorganized so that the new Hatteras 80 offers a contemporary interior. The bar was removed, giving more space for a large lounge corner. The galley forward was also modernized. The lower deck accommodates eight guests in four cabins, a full-beam master, a VIP forward and two twins. Again the decoration was changed, with light and warm colours. Even the crew quarters for 4 were reorganized, with a large double captain's cabin and a real dining area with kitchen. 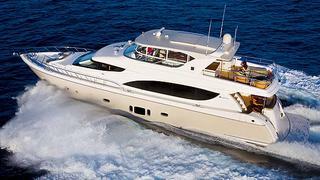 Following European standards, this new Hatteras 80 motor yacht has become really attractive and is already a success. The first hull, called H2Ome, was recently delivered (our pictures) and several sales were reported during the FLIBS. Now Europe becomes a real target for this voluminous pocket superyacht, and her attractive price ($5.3 million, base price with twin 1,600hp Caterpillar C-32 engines) will undoubtedly seduce many future clients.